Measuring a massive 2.5-inches wide by 4.5-inches long, our Platform-Style Adventure Footpegs provide an extremely stable base from which to control your bike— even over the gnarliest terrains. Their rugged design is cut from aircraft-grade aluminum, and like cat claws on a carpet, precision cut traction cleats provide a grip that’ll hold you on the pegs. They’re extremely lightweight, too, at only 8 oz. each. These pegs are 2.5-inches wide x 4.5--inches long and weigh 8 oz each. They greatly improves control of bike—its like adding power steering! 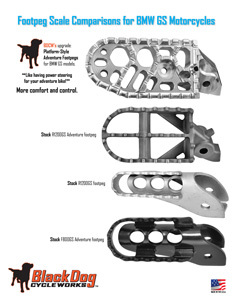 These pegs are milled out of Tough aircraft-grade aluminum alloy. The teeth on our Platform Footpegs are flat which provide a perfect balance between traction and wear & tear on the soles of your riding boots. For more traction in wet conditions, be sure to check out our Traction Footpegs which have pointed teeth in addition to thread-in spikes for maximum traction (not available for all models). We are the only company we know of that provide an special “installation pin” which greatly simplifies installation. We also provide replacement cotter pins—no trips to the hardware store required. 5 minute install time. No bones about it, we manufacture all of our Black Dog products right here in the U.S.A. - supporting the local craftsmen, materials and machinery. We have world class manufacturers in our own back yard and we are committed to supporting our local economy which is extremely important to us. We feel supporting the U.S. manufacturing base has never been more important.